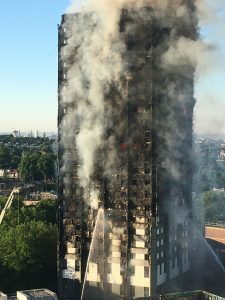 There has been a huge and understandable outpouring of anger over the Grenfell Towers fire, and I want to focus on anger in this blog. Society endlessly struggles with anger, swinging between fear of the harm that anger can do, and fear of the harm that it does to suppress it. The twentieth century became increasingly tolerant of anger, compared to the Victorian period, and I am broadly sympathetic to that. I think the earlier fears of anger were often exaggerated. At Grenfell, people understandably want information about missing people, and are angry that it is not available. They also want to know how the fire spread so quickly, resulting in the loss of so many lives. The trouble is that the information people want is not easily and quickly available, which leaves the mood of public anger boiling over. In recent decades, psychology has developed quite good methods of ‘anger management’ therapy, but they are applicable only to individuals, not to whole communities. The very idea that the anger about Grenfell needed to be ‘managed’ would be seen as inflammatory. The issue about most emotions such as guilt or anger is not, I would argue, whether they are good or bad, but when they are good and when they or bad. I believe we need a more discriminating approach to strong emotions, with better discernment about when they are constructive and helpful, and when they are excessive and destructive. Basically, I agree with what Cardinal Vincent Nicholls said at a Mass in Kensington, that anger is inevitable in such a situation, and the key issue is how it is directed. Religion has tended to be over-cautious about anger, and on the side of curbing it. But that seems mistaken. The stories that have come down to us about Jesus’s anger are interesting and helpful. Clearly he got angry, for example over the pattern of extortionate money-changing in the temple, and about the prohibition on healing on the Sabbath. Mark’s gospel refers quite explicitly to Jesus’ anger. It is what has come to be known as ‘righteous anger’. I can imagine the Grenfell fire being the kind of thing Jesus might have got angry about. It is not appropriate to complain about such anger; it is a fact of life. There is obviously good that can come from the anger. It can provide the energy and determination to see that such a fire is never repeated. It is important for short-term anger to be translated into long-term determination. The danger is that, as the immediate anger fades, so the sense of urgency and determination also fades. That channelling of anger depends on leadership. Both the national government and the borough council seem to have been slow to catch the public mood, though they are now belatedly catching up with practical action. It is the lack of effective and articulate leadership from people in positions of responsibility that has left the anger about Grenfell Towers dangerously close to getting out of hand. It is not enough to take the right practical steps. Anger of the kind we have seen at Grenfell needs a voice. That voice, to have credibility, needs to be raw and passionate. Only then can anger be channelled constructively. Copyright © 2019 Fraser Watts. All Rights Reserved.